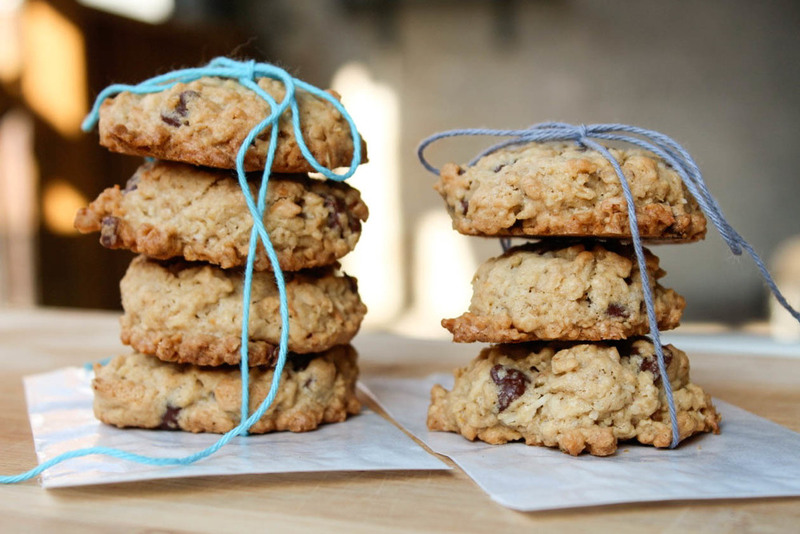 oatmeal coconut chocolate chip cookies — Mel bakes things. I have a confession to make. I'm that conceited jerk who thinks that they can one-up other people's cookies. Okay, not everyone's. But if you take me to a bakery or a cafe, I will probably make faces at you if you order a cookie (ask Brandon, I do it to him all the time). I'll more than likely refuse to try it until you force me, and once I try it, I'll immediately start thinking of ways to make it better. That's how this cookie happened. They're deliciously chewy, and not overly sweet. You could add nuts and/or dried fruit if you wanted to, too. That would make them almost like trail mix cookies, which pretty much sounds like the perfect snack food. Why didn't I do that? Two notes: One, I used semi-sweet chocolate chips and found them to be a little overpowering. You may want to change it up and just use your favorite kind of chocolate bar chopped into smaller pieces. Two, unsweetened coconut can be hard to find. Whole Foods usually has it. You can use sweetened coconut too, but I'd dial down the sugar a bit, or use less coconut. Preheat oven to 350F and line baking sheets with parchment. Whisk flour, salt, baking powder, and cinnamon together. Set aside. Using your mixer and the paddle attachment, beat the butter and sugar on medium speed until light and fluffy...2-3 minutes. Add the egg, and mix for another 30 seconds or so. Add oats and coconut, and mix another 30 seconds or until just combined. Scoop rounded tablespoons, and place them 2 inches apart on the baking sheet. Bake for 15-20 minutes, or until cookies are golden brown around the edges. Keep an eye on the first batch to gauge your timing. Cool on the baking sheet for 2 minutes before moving to a cooling rack.